Add sugar, cocoa and salt into a large cup. Heat milk in microwave on high for 1 minute or until hot. Pour milk into cocoa mixture; stir. Place green beans and soup in a large microwave-safe bowl. Mix well and heat in the microwave on HIGH until warm (3 to 5 minutes). Stir in 1/2 cup of cheese and heat mixture for another 2 to 3 minutes. Transfer green bean mixture to a casserole dish and sprinkle with French fried onions and remaining cheese. Bake in a preheated 350 degrees F (175 degrees C) oven until the cheese melts and the onions just begin to brown. Bring pot of water to boil. Add potatoes and simmer until tender (about 15 minutes). Drain potatoes and place in large bowl. Add Earth Balance and use a potato masher or fork to mash. Preheat oven to 375°. Spread bread cubes out on baking sheet. Bake until toasted (about 10-15 minutes). Transfer bread to large bowl. Heat vegan butter in pan on stove at medium heat. Add onion, garlic and celery and sauté until vegetables are soft (about 15 minutes). Add mixture to bowl with bread cubes. Stir thyme, rosemary, salt, pepper and egg replacer into bowl. Slowly add vegetable broth, being careful not to make bread too soggy, and stir. I added 1 cup at a time and let it absorb for a minute before adding more. Grease mini muffin tin. Spoon mixture into each spot, packing it down and filling it slightly above the top. Bake in oven for 18-20 minutes, until edges are browned. Remove from oven and let sit until cool enough to handle. Add a scoop of mashed potatoes on each muffin and top with gravy. Preheat the oven to 350 degrees F and remove the top rack. Combine the butter and sage in a mixing bowl, mash with a fork or spoon until the sage is well incorporated and the butter has flecks of green in it; season with salt and pepper. In a saute pan, melt 4 tablespoons of the sage butter, add the onions, cook and stir for 15 minutes until soft and golden. Remove from heat. Put the cornbread in a large mixing bowl and scrape the sauteed onion mixture on top. Add the egg, heavy cream, and just enough chicken stock to moisten the stuffing without making it soggy (about 1/2 cup.) Toss well to combine, season with salt and pepper. Remove the neck and gizzards from the inside of the turkey and discard. Rinse the bird thoroughly inside and out with cold water, pat dry. Sprinkle the cavity and skin liberally with salt and pepper. Using your fingers, gently lift the skin from the breast and legs, and slip pieces of the sage butter underneath; massaging it in as you go. Fill the bird with the cornbread stuffing without packing too tightly; cook the remaining stuffing separately in a buttered baking dish. Truss the turkey; place it on a rack in a large roasting pan, and put into the oven. Meanwhile, in a small mixing bowl, whisk together the maple syrup and hot water to thin the glaze out a bit; use this to baste the turkey every 30 minutes. The turkey should take about 3 hours to cook (i.e. 15 to 20 minutes per pound.) If the legs or breast brown too quickly, cover with foil. About 2 hours into cooking, shingle the strips of bacon oven the turkey breast to cover; continue to roast and baste for another hour or so. The turkey is done when an instant-read thermometer inserted into the meatiest part of the thigh registers 170 degrees F (the thigh juices will also run clear when pricked with a knife.) Transfer the turkey to a cutting board and let rest for 20 minutes before carving, so the juices can settle back into the meat. Skim off the excess fat from the pan drippings with a spoon and place the roasting pan over 2 burners set on medium-high heat. Using a wooden spoon, scrape up brown bits stuck to bottom of pan. Whisk the flour into the drippings, stirring as it thickens to prevent lumps. Add the remaining chicken stock and bring to a simmer; season with salt and pepper and hit it with a squeeze of lemon juice to brighten the flavor. Simmer for 5 minutes and then strain to remove any particles. Serve the gravy with the maple-roasted turkey and cornbread stuffing. Using kitchen shears, cut open guajillo and ancho chiles along one side; place seeds in large bowl; set aside. Open chiles and place flat in a large dry skillet over medium heat. Cook, turning once, until lightly puffed and toasted, about 4 minutes. Add chiles de árbol and cumin seeds ; toast until fragrant, about 1 minute. Transfer to bowl with chile seeds, add 4 cups boiling water, and let soak until softened, about 10 minutes. Purée chile mixture with soaking liquid, onion, and garlic in a blender. Combine beer, brown sugar, 1 bunch oregano, 1 cup salt, 3 cups chile paste, and 8 cups water in a very large stock pot. Add turkey, cover, and chill at least 12 hours and up to 14 hours. Remove turkey from brine; pat dry. Place, breast side up, on a rack set in a large roasting pan. Mix remaining 2½ tsp. salt into remaining 1½ cups chile paste. Working from neck end of turkey, gently loosen skin from breasts and rub under skin and all over outside of bird. Chill turkey at least 8 hours and up to 12 hours. Preheat oven to 375°. Stuff turkey with onion, garlic, and remaining bunch of oregano; tie legs together with kitchen twine. Add broth and 2 cups water to pan and roast turkey 30 minutes. 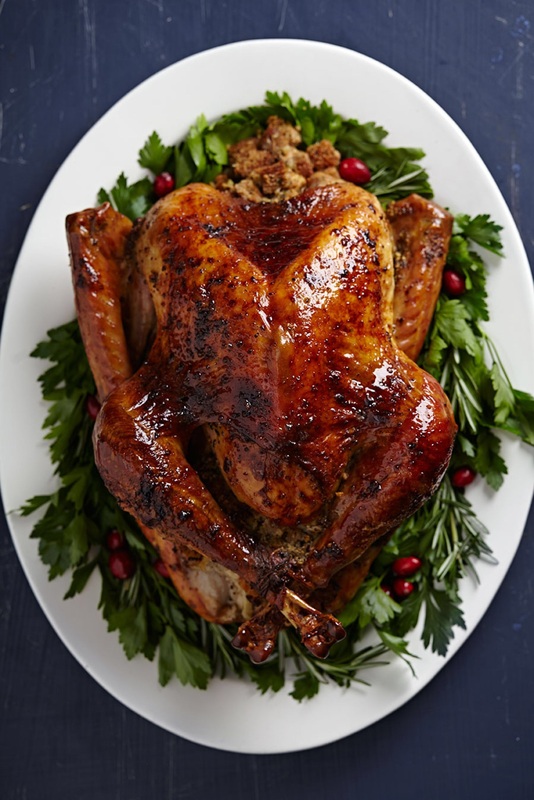 Reduce oven temperature to 325° and roast, basting every 30–40 minutes with butter, adding more broth or water as needed to maintain some liquid in pan, and tenting with foil if turkey browns too quickly, until an instant-read thermometer inserted into thickest part of thigh registers 165°, 2½–3 hours longer. Meanwhile, strain pan drippings into a measuring cup. Let sit 30 minutes, then skim fat from surface. Bring to a boil in a medium saucepan; reduce heat and simmer until reduced to 1 cup. Stir in lime juice. Garnish turkey as desired and serve with pan sauce alongside. Have you been to our Instagram? 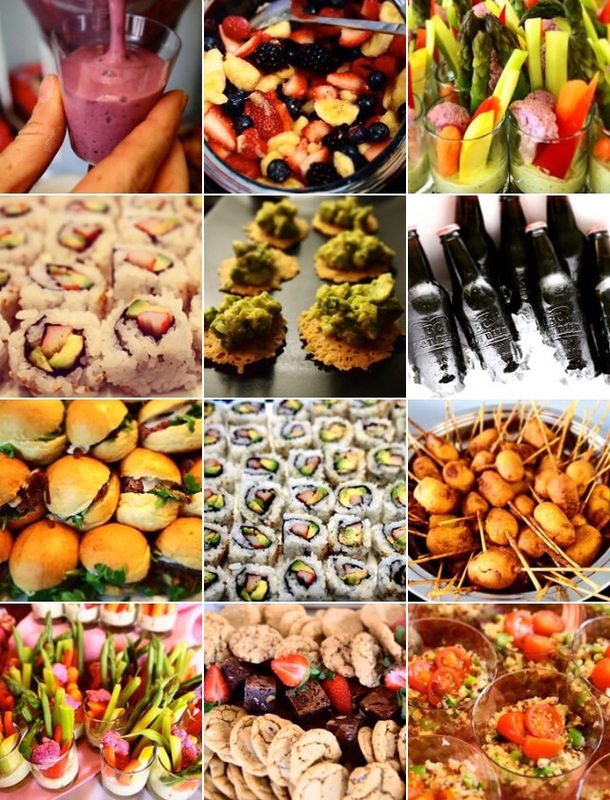 If not, check it out and follow us @annabelscatering! Toast whole sage leaves in a skillet over medium-high heat for 2 minutes. Put sage into a large pot with 2 cups salt, sugar, and 2 quarts water. Bring to a boil, remove from heat, and stir in 6 quarts water; let cool completely. Put brine and turkey into a brining bag; seal and refrigerate for 8 hours or overnight. Preheat oven to 325°. Mix chopped sage, butter, garlic, salt, and pepper to form a compound butter; set aside. Remove turkey from brine; pat dry. Lift skin at neck of bird; cut and remove wishbone (make a wish and discard, if you like). Place turkey on a rack in a roasting pan, breast side up, and tuck wings under the body. Rub turkey all over with half of compound butter; rub remaining compound butter under skin of turkey. Tie legs together with butcher’s twine. 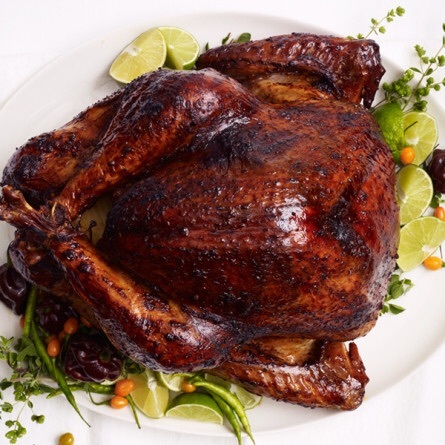 Roast turkey, basting every 30 minutes, until deep golden brown and a thermometer inserted in the thickest part of the thigh (not touching bone) registers 165°, 2 1⁄2–3 hours. 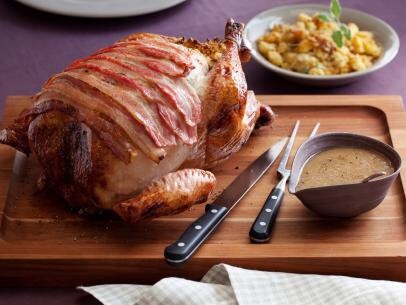 Let turkey rest for 20 minutes before carving (see How to Carve a Turkey).